Soup! I've always loved soup. It's so easy to eat, it stays hot for a while, and it's so easy to tweak to taste. I usually use Weight Watchers cans and thicken it with a little oat flour, add some carrots for body and either a soft boiled egg for added protein and simple, comforting flavour, bursting it open once I've finished the soup, or a hard boiled egg finely chopped and stirred throughout for a little more bite. But those are lazy days, and none of it ever actually beats homemade soup! I know a lot of people get quite down in the winter, suffering from SAD, but I relish it for the most part. I put it down to a passion for Christmas and the fact that mine and Seeg's birthdays fall in the same time of the year. There's a lot going on! So I'm actually quite energised by the onset of winter, and spend a lot more time in the kitchen testing recipe ideas or tweaking old favourites. And so it's not all that surprising that soup, a personal and worldwide winter favourite, should be on that list. I'm also sure you've noticed that I obsess over ingredients. I made a few things with figs this autumn, and now it seems that chestnuts have fallen into position. I've already made nutmeg chestnut porridge and I have a few other things still to come with chestnuts as a key ingredient. 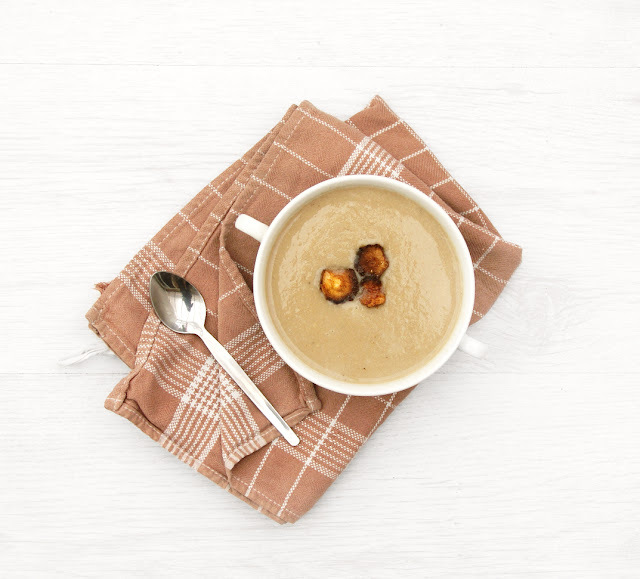 But for now, we'll stick with this thick and hearty, wholesome parsnip & chestnut soup. This soup is gorgeous. The earthy nuttiness of the parsnips is complimented by the subtle sweetness of the chestnuts, and the soup as a whole is very earthy and mild. But don't be fooled just because it's easy on the tastebuds - most foods, soups included, that grace our tables are packed full of flavour to the point that a number of the ingredients go unnoticed. Not so, here. It's simple, but refreshingly so, and wonderfully comforting for that simplicity. It's also so easy to make, and 1 serving counts as 1 of your 5 a day. 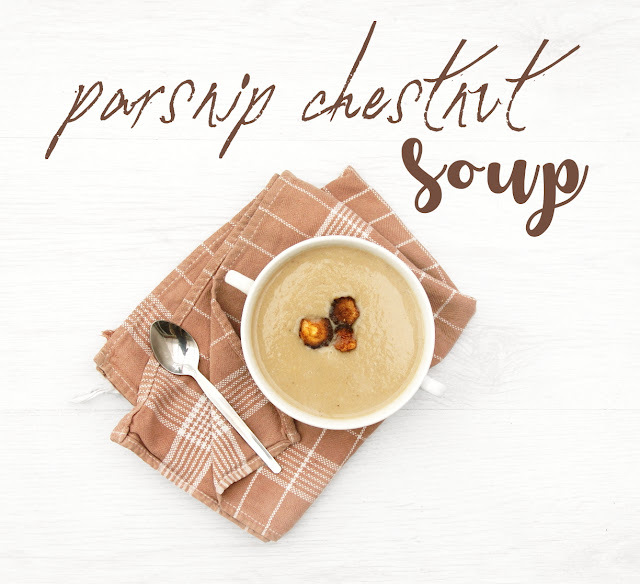 It's also versatile, serveable as a soup or a chestnut parsnip stew (see notes). 1. In a large saucepan over medium heat, brown the onion for about 5 minutes. 2. Add the parsnips and crushed garlic and sautée for another 5 minutes. 3. Add the chestnuts or chestnut purée and the vegetable stock, stir and increase the heat to a boil. Turn down and simmer for 30 minutes, until the parsnips are soft. 4. Season with salt and pepper, and add the protein, if using, and stir. 5. Remove from the heat and transfer to a blender, or use a hand-held blender. Mix until smooth. 6. Garnish with crisps and serve immediately, or transfer to a 1.5 litre jar, set aside to cool and then store in the fridge for up to a week. I used this for lunch on Tuesday and Thursday, and it was just as good reheated as it was fresh. *Alternatively, you can serve this some recipe as a casserole between 4: pour the blended soup into an oven dish, add some chicken breast and dumplings - to make the dumplings mix 100g self raising flour, 50g chestnut flour & pinch salt in a bowl, add 100ml milk, mix until it forms into a dough; split into 8 balls, set in the soup, cover and set in the oven for 30 mins, 190C / 375 F/gas mark 5. The dumplings will look small, but, trust me, they will at least double in size. 190 cals, 40g carbs, 6g fibre, 3.5g protein, 1 of your 5 a day.